As organizations look to set bold goals for the future, many will turn to people, platforms and processes to power their journey forward. But what are the big trends in data and analytics, technology and computing that will directly impact how we work, how we secure and how we advance organizations to a better tomorrow? From shifts in data management, analytics and security to new thinking in how to orchestrate digital transformation and activation, the future holds endless opportunities for those who can navigate it effectively. Digital transformation is, for most executives and organizations, top of mind as we look to shift our people, processes and platforms to a more connected, efficient and effective ecosystem. For many brands, the reality is that transformation has not come at the behest of an internal quest for innovation but rather to keep up with a connected customer making new choices based on experiences and value delivery. But the quest for transformation has been rife with buzzwords, failed promises and more than a few platform investments that have only partially yielded results. Teams continue to be hampered by fractured operations and limited access to customer intelligence, and there is growing frustration that transformation initiatives may prove to be never-ending with no real payoff in sight. The call to action for business leaders focused on growth is to shake off the missteps of past transformation programs and embrace new strategies that empower employees to act. This also means entrusting teams with intelligence and insight into the customer, and better connect and align teams and partners across the customer engagement lifecycle, in order to deploy truly relevant and meaningful experiences. These experiences, according to today’s customer, must be personalized, relevant and must not violate the customer’s trust that the data they have provided the brands they love has not been misused or mismanaged. Marketers are listening for the voice of the customer. According to early findings of a study from the CMO Council in partnership with SAP Customer Experience and Hootsuite, over 60 percent of the marketers based in Europe have formal customer listening initiatives in place. Unfortunately, only eight percent of European marketers believe these programs are “excellent”, with most marketers admitting that their listening programs are just “fairly good”, listening through corporate owned formal feedback channels, but struggling to ingest unstructured intelligence from across the organization. Part of the issue could be how organizations view critical listening posts. With early indicators pointing to marketers primarily viewing channels like social media as either free engagement tools or PR amplification channels, it is not a surprise that many marketing leaders are looking to tackle the issue of leveraging intelligence from customer voice to better deliver consistent, contextual and personalized experiences. The big question becomes how. For obvious reasons, video represents an unprecedented level of opportunity for companies looking to amplify their digital engagement efforts. However, many companies still lack a formalized strategy for implementing video, and worse, the metrics currently being used to gauge the success of video are questionable, at best. Many organizations are still applying the same metrics for online video that they use for TV advertising, and with Facebook and Google both admitting to flawed, incomplete and often incorrect reporting structures for video campaign outcomes, it is becoming more important than ever for marketers to establish reliable strategies and metrics for video performance. With the level of opportunity that video presents, how can marketers ensure that they are getting the biggest bang for their video investments? What metrics truly matter when it comes to understanding video campaign success, and how can marketers achieve the contextual consistency they need to really understand how their videos are performing? 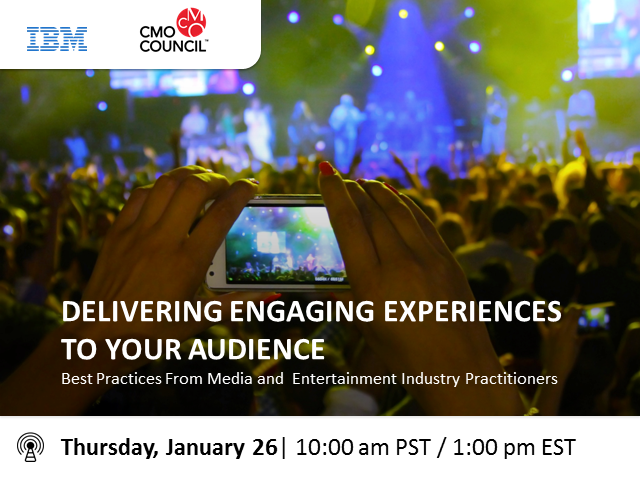 To address these issues, the CMO Council will be hosting a webinar to explore the greatest barriers to success when it comes to implementing video campaigns that deliver the intended results, in addition to the metrics needed to gain full transparency into video performance to understand who is viewing videos—as well as when and where they are being viewed—and determine their impact on the bottom line. The webinar will be on July 10 at 10am PST/1pm EST, and presented by Mary Anne Hensley, Director of Content and Marketing Programs here at the CMO Council; Ben Segal with Vuble, and Mike Olson with Fox Rent-a-Car. Please join us for the CMO Council’s upcoming live webcast, in partnership with IBM, “Doing More With Data.” Join us on June 7, 2018 at 10am PT / 1pm ET as we explore how the shift toward the customer has necessitated innovation across data, analytics and holistic operations. -Gaps and deficiencies in the data value chain as it results to customer journey, path to purchase, lifetime value, and end-to-end experience. Each year, Microsoft and its technologies and products are mentioned over 115 million times in the social ecosphere. How does a company like Microsoft leverage social media as a mechanism to build relationships with audiences including prospects, customers and fans? The Microsoft Customer Experience Center (CXC) manages social engagement programs for over 30 of Microsoft’s core brands and audiences across 110+ social channels, with the overall purpose of building rich customer experiences through quality audience engagements. Imagine, for a moment, walking into a store where you have only made a purchase one time before. The salesperson runs up to you and greets you by name, and before you can get a word in edge-wise, he offers you five other products that are almost identical to the one you purchased before. Then, without warning, he invites you to talk with five other customers who not only look eerily similar to you, but are also all wearing the same item you purchased. Then, as you begin to hasten your exit—because at this point, you are fairly certain that the salesperson is a stalker—he begins to shout down the corridor after you, begging you to come back and offering you coupons and discounts as your brisk walk turns into an all-out sprint away from the insanity. It is so easy to imagine this scenario in real life, but it is far more difficult to admit that this is the very experience that many of us have inadvertently created for our customers across the omnichannel landscape. So it begs the question: When did we forget how to build real relationships with real, live human beings? In this latest installment of the CMO Council’s thought leadership series, “Get to Know a CMO,” Liz Miller will have a one-on-one session with Frank Grillo, Chief Marketing Officer at Harte Hanks, seasoned veteran of the advertising, marketing and telecommunications industries, and a passionate advocate for bringing the human back to marketing. Join the CMO Council as we hear Frank’s position on what customer centricity truly is (and what it isn’t), how marketing can be made human again, and where we lost our relationship skills somewhere along the way. Liz will also be asking Frank about his own path to becoming a CMO, which has seen stops along the way as the COO of telecommunications companies and a long track record of serving as the chief growth engine and customer experience orchestrator for large, dynamic organizations. In the ongoing dialogue around touchpoints, experience, engagement, data and the ever-growing martech stack, why is it easier to talk about replacing email platforms than it is to talk about what is going wrong with our email strategies? In our quest for personalization, when did email become a commodity of communication and not a strategic engagement? Is it too late to shift the strategic mindset from blasting to engaging? The CMO Council, in partnership with Adestra—the official engagement platform of the peer-powered network and one of the most trusted names in email and technology—will host an interactive executive roundtable to debate and discuss where and how data-rich engagements, including email, have shifted and transformed strategies. From customer experience to relationship management, email has long been the cornerstone of ongoing customer campaigns, but rather than being seen as a channel of influence, loyalty-building and customer engagement, it is traded as a commodity—the cheapest option in the direct marketing toolkit. • Redefining email engagements for the C-suite: Where and how should the discussion shift? • Calculating the cost of irrelevance: What is the real risk facing brands that continue to “spray and pray” in today’s era of rapid customer defection? • Are we ready for what’s next? From engagement in the age of GDPR to building trust in the era of Cambridge Analytica, how do we prove that we know our customers and simultaneously earn customer trust through our digital engagements? Imagine, for a moment, taking on transformation at the size of Microsoft. As a global, multinational, billion-dollar organization, scale alone could be daunting…after all, you are asking more than 124,000 employees to change along with you. But transformation is exactly what Microsoft achieved, up-ending corporate structure, breaking down product-centric silos and fostering a culture of market-centric and customer-centric innovation to advance the organization. The second webcast in our series will focus in on how this massive transformation impacted, shaped and empowered marketing leaders in the organization to engage with the customer in completely new and different ways. The Chief Marketing Officer (CMO Council) and RedPoint Global are partnering to host a one-hour webinar on May 1, 2018, at 10am PST/1pm EST to discuss our latest report—titled “The State of Engagement: Bridging the Customer Journey Across Every Mile”—which reveals how brands are using connected, contextual and personalized engagements to reach customers through the last mile of their journey with a brand. Join Liz Miller, SVP of Marketing here at the CMO Council, and John Nash, Chief Marketing and Strategy Officer for RedPoint Global, as they unveil the findings from a quantitative survey of more than 150 marketers, in addition to insights from interviews with marketing leaders at Coca-Cola, AllRecipes.com, Aston Martin and more. Miller and Nash will explore the issues and challenges that organizations continue to struggle as they look to deliver consistent, reliable, data-driven and personalized engagements across an ever-expanding list of touchpoints. They will also share the strategies that leading companies are using to turn intentions into measurable action. The webcast will also take a closer look at the brands that are successfully differentiating themselves through better engagements by delivering the experiences that consumers want. We are thrilled to announce the CMO Council’s upcoming live webcast, in partnership in Sendwithus, “Gaining Traction With Every Digital Interaction.” Join us on April 18, 2018, at 10am PST/1pm EST as we explore the key issues, needs and challenges around advancing and optimizing revenue opportunities through digital engagements. Sales and marketing leaders alike chase efficiency through automation and tool integration to scale their functions. However, too often they’re operating in siloes, inadvertently bombarding prospects and customers with disconnected, non-contextual outreach from all sides. It’s bad customer experience. And in a time when businesses are trying to focus on building lasting customer relationships and a recurring revenue model, automating a bad experience creates alienation at a massive scale. Join Justin Shriber, VP of Marketing at LinkedIn, to learn what makes a good customer experience and the imperative new approach required to help sales and marketing overcome this fundamental gap to align towards an orchestrated approach to tap into the massive source of economic growth and opportunity that is the B2B market today. A CMO’s success often hinges on the success of the brand to drive business and grow revenue. Because of this, the CMO is in a unique position to optimize growth by meeting the demands of their customers while driving and advancing digital transformation. But transformation for technology’s sake will not advance the business. To be successful in today’s highly competitive market, the customer needs be front and center – the CMO must lead a truly customer-centric revolution. Customer centricity is about building relationships, conversations and service around the needs, preferences and actions of individual customers on an ongoing basis. By putting customers first and meeting their expectations across all channels, you can deliver exceptional experiences that drive retention and build loyalty. The key is to deliver a consistent, seamless experience across all touchpoints, and ensure that all interactions are relevant to each and every customer. To accomplish true customer-centric marketing, you must understand each customer at the individual-level, down to their individual Customer DNA, and be able to rapidly take action on those insights. Join the CMO Council as we welcome experience and data expert, Cindy Vandecasteele, NGDATA’s VP of Product Strategy, and Jeroen Bronselaer, Senior Vice President Residential Marketing at Telenet, as they share their own experiences in transforming a brand with customer-centric marketing. True one-to-one interaction is considered the holy grail of customer experience. However, according to a recent CMO Council study, only 7 percent of marketers are able to consistently create these individualized experiences across all channels. For the third and final webinar of this series, the CMO Council and Teradata are concluding the conversation around shaping customer experiences by focusing on the importance of coordinated cross-channel messaging through a centralized hub for all customer interactions—one that listens to all interactions, automatically tells marketing channels when and about what to say based on all the latest data and machine-learning analytics, and applies contact governance so that your marketing is smart and optimized, not fragmented by channel. During this one-hour webinar, our expert panel will share insights around how companies can build one central messaging hub for all customer interactions, regardless of channel. Marketers can elevate their marketing with a marketing hub to optimize and coordinate messaging, analytics and data so that the messaging automatically shifts, whether it’s time to sell or time to provide customer care, ensuring that each interaction is good for the customer and the brand. A featured brand expert will also share their company’s challenges in this area, as well as the steps they have taken in order to create consistent cross-channel messaging for the customer and make one-to-one experiences a reality for their organization. Today’s marketing machine must be aligned to the agile flow of today’s fickle customer, able to adjust and adapt in real-time, thinking and often predicting behaviors in context to allow an organization to swiftly advance, iterate and optimize across functional boundaries. The CMO Council, in partnership with IBM Watson, will share new thinking and best practices for making this new marketing operation a reality in a one-hour interactive webcast featuring subject-matter experts and brand leaders currently making the bold shift to meet the customer where they stand. Joining the session will be Dario Debarbieri, CMO of IBM Watson North America and longtime CMO Council Advisory Board member, who will discuss the latest trends, from the API economy to the real opportunity of cognitive computing being applied to the marketing engagement engine. It is easy to commit to delivering to exceptional customer experiences, but executing on the same can often be the hardest step. Join CMO Council, Teradata and N Brown Group (JD Williams) in part 2 of our webinar series to hear how organizations can enhance the customer experience and influence their buyers’ next steps to align with organizations’ desired goals and objectives. During this one-hour webinar, Vicky Currie, Head of Segmentation and Selections in the Customer Insight Group for N Brown Group (JD Williams), will share insights around how the company transitioned from just collecting customer data to influencing customer decisions with predictive insight. Specifically, Currie will share how N Brown Group moved from mapping the customer journey to actually understanding where customers are in the buying process, and then intervening with the right offer, at the right time and through the right channel, to lead customers to a purchase. Hear Currie explain how the ability to combine insights with action has helped the company meet business objectives, drive revenue and, above all, improve the customer experience. Joining the CMO Council and Vicky Currie will be Tony Brown, Vice President of Product Management and Business Development, Teradata Customer Journey Solution. Tony will share insights on the critical steps marketers must take to better inform and shape the buyer journey. Join Liz Miller, Senior Vice President of Marketing for the CMO Council, and Kathy Koontz, Director–Customer Journey for Teradata, as they discuss the steps that marketers can take to better inform and influence the customer journey. At the dawn of the digital age, email heralded a bold turn away from junk mail and battling the paper bulge of the overworked mailbox. But in today’s crowded engagement landscape, email has started to feel more like a cheap imitation of its scan-and-junk bulk snail mail predecessor. According to the technology research group, Radicati, 205 billion emails are sent each day. Not even social can compete with the power of email, according to a Forrester report that indicates that people are twice as likely to sign up to receive a brand’s emails as they are to interact on Facebook. But, as email open rates are increasing year over year according to Epsilon, rising from 31 percent to 34.1 percent, email CLICK rates are in decline, dropping from 3.5 percent to 3.1 percent in Q3 of 2016. Nonetheless, email continues to deliver. According to the Direct Marketing Association, in 2016, email had a median ROI of 122 percent, nearly four times higher than other marketing tactics including social, direct mail and search. And, according to a recent CMO Council study, 52 percent of consumers surveyed say email is a critical part of the customer experience, second only to access to a corporate website. The spray and pray messaging approach of old is no longer applicable to emails. Where personalization reigns, what are the new rules of email marketing engagement and how have CMOs adjusted strategies to optimize emails as part of a holistic customer experience? Join the CMO Council as we assemble a panel of marketing leaders who have all evolved email strategy to advance the customer experience and pull this powerful point of connection out of the junk mail pit. In a study conducted by the CMO Council in partnership with IBM, 42 percent of marketers surveyed indicated that their top digital experience goal in the coming year was to better connect the multitude of campaigns being executed across the organization into a comprehensive, connected customer experience that could drive engagement throughout the engagement lifecycle. The challenge is how they will get there when 56 percent of marketers admit that data for their organizations is in more of a state of collection than action, or data is only being used to measure past activities. How will marketers—who are struggling to turn data to insight and insight into action—be able to reach their goal of a connected, robust digital experience? That is, how will marketing achieve this goal along with all of the other engagement, experience and operational goals that they must reach? How can data stop being a challenge and start being the fuel for innovation and engagement? Enter the new era of analytics and operations that look to “machines” to deliver smarter decisions and outcomes through amplified analytics and improved experiences. You have likely heard buzz around machine learning, artificial intelligence or cognitive computing. Perhaps you have thought that these terms are more buzz than reality—don’t they all just mean the same thing? If you are like the 24 percent of senior marketing leaders that the CMO Council surveyed, you are not 100-percent sure what cognitive computing is or what value it could bring to the organization. To help answer some of these questions and to bring some much-needed definition to this evolving and exciting conversation, the CMO Council will be speaking with Brady Fox, who leads strategy and execution for North American Sales with IBM’s Watson Marketing and Predictive Analytics group. Data, data everywhere…but where is the insight to drink? This could be the new battle cry for today’s CMO. Regardless of industry or region—whether it’s a B2B or B2C company—all CMOs are facing the evolution of data and its twin: digital. From what digital transformation means to an organization to the challenges we each face as our customer demands even higher levels of personalization, CMOs today are talking about where and how digital and data converge and what that collision means for the bottom line. Join Liz Miller, Senior Vice President of Marketing for the CMO Council, as she gets to know Maria Winans, CMO of IBM Watson Customer Engagement. The discussion will span from insights into how Winans is facing the digital revolution to the trends she believes will shape marketing and engagement in the months and years ahead. The one-hour, interactive conversation will also take questions from the live audience, giving participants a unique opportunity to pick the brain of a true peer. A graduate of University of North Carolina at Chapel Hill, Winans has spent more than two decades at IBM and has been at the forefront of both data and digital’s evolution. A true global business leader, Winans has served in leadership roles at IBM across Business Analytics, Collaboration Solutions, Mobile, Industry Solutions and PC Company, as well as serving as a Marketing Strategist for IBM Latin America. The Chief Marketing Officer (CMO) Council is dedicated to high-level knowledge exchange, thought leadership and personal relationship building among senior corporate marketing leaders and brand decision-makers across a wide range of global industries. The CMO Council's 15,000 plus members control more than $400 billion in aggregated annual marketing expenditures and run complex, distributed marketing and sales operations worldwide. In total, the CMO Council and its strategic interest communities include over 12,000 global executives across 100 countries in multiple industries, segments and markets. Regional chapters and advisory boards are active in the Americas, Europe, Asia Pacific, Middle East and Africa. The Council's strategic interest groups include the Coalition to Leverage and Optimize Sales Effectiveness (CLOSE), Marketing Supply Chain Institute, Customer Experience Board, Loyalty Leaders, Online Marketing Performance Institute, and the Forum to Advance the Mobile Experience.